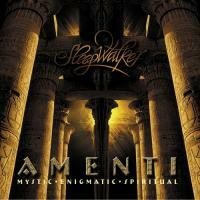 The new album of Sleepwalker - "Amenti" approves a private style and incredible sound "Sleepwalker". An ingenious composition elements and inovatory approach create an impressive and rememberable sound picture. A tender blend of low and high acoustic guitar lines with a soaring wordless vocals moving in and out of the background, noble tones of Native American flutes and innovatibe combo of bongos, djembe, doumbek and timbal fits nicely in the New Age, World & Ethnic genres. The orchestration goes beyond the traditional conceptions for a musical background and rather reminds of qualitative soundtrack. As the height of perfection the album is mastered by the Grammy award-winning engineer Bob Katz, Digital Domain Studio (www.digido.com), USA. Amenti is the second full length album from Bulgarian musician Lyubomir Yordanov, in the interim between albums Sleepwalker also released the single A Tear For Kursk. There is a marked development in both style and production on this latest project - Lyubomir delivers a polished, unique vision that is lifted above the average by his own well crafted compositions as well as by the involvement of so many other skilled contributors. The updated Sleepwalker website is a visual delight with lots to explore, containing plenty of information and sound samples as well as a store should you wish to buy the album. This project has just stepped up to a whole new level. What is "New Age Music" the answer for me is not a quasi religious bag of spiritual anthropomorphism. I stay away from the term "New Age" preferring the more secular label of "Adult Contemporary". That said I was unprepared for the powerful personal emotions and intellectual responses this evocative music generated within me. Humanistic is the overall term I would use to describe the concepts behind this music. In many ways is a musical tribute to the triumph of the human spirit. Travel from the primordial forests to the opera hall of Vienna. Sing with the shaman to Madame Butterfly. There is a song within us, the words remain the same whatever the language or culture. It is a song of being human. There are two powerful forces unleashed on the planet by human culture. Art and technology, and just as Chernobyl darkened the skies of the east. We find in art and possibly the halls of Amenti, that anything is possible. Life, hope and spirit. Thank you for potentiality to bye this album. Sleepwalker, you are a great musician. Your sound like Emma Shapplin, Era, Enigma, Gregorians, Trance Opera, Deep forest, B-Tribe, Bardo State, Ambra - this is fantastic. I am proud to be Bulgarian.